The recipe direction is ridiculously simple. 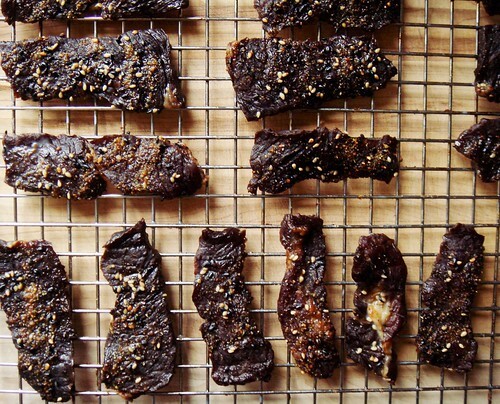 Marinated thin slices of beef are oven dried until they resemble jerky. I took inspiration from the original recipe and made a few ingredient substitution to take advantage of the well-stocked Korean grocer in my neighbourhood. My version of the marinade had sweetness from crushed Asian pear nectar and citron marmalade. Instead of jalapeno, I added mild heat with bean chilli paste gochujang. What the original recipe did not tell you is the ridiculous amount of marinade it makes. When every ingredient is accounted for, you get well over a litre (4 cups) of the flavourful marinade. That is a generous amount for just 2 pounds of thinly-sliced beef. It was enough for 5.5 pounds of meat as I did last weekend. I certainly could turn all that meat to jerky but I had other plans. I had nothing planned for Sunday family dinner so I pan-seared a bunch for a beef bulgogi dinner. Served with Romaine lettuce, sesame leaves, steamed rice, assorted grilled vegetable, and more gochujang, it was a satisfying meal with no extra work. As for the jerky, I experimented with two different cuts of meat. I bought 1.5 pounds of pre-sliced chuck at the Korean grocer and 4 pounds of inside round from Costco which I hand-sliced. The convenience of using pre-sliced high quality beef was hard to beat though of course it came at a premium price. If your knife skill is questionable, it is definitely a great option because uniform thickness means the jerky dehydrates at the same time. 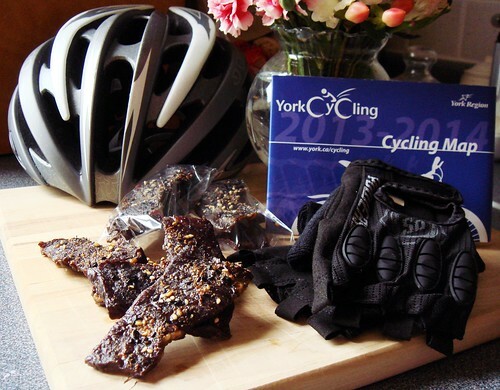 I dusted the jerky with Japanese chilli powder shichimi togarashi and black and white sesame seeds. 5 hours of low and slow baking was just right for my batch. The jerky did not dry up too much but still had good chew. Unlike commercial products, they were not overly salty. I had mix feelings about the marinade. With all that flavourful ingredients, the taste was not as vibrant as I anticipated. 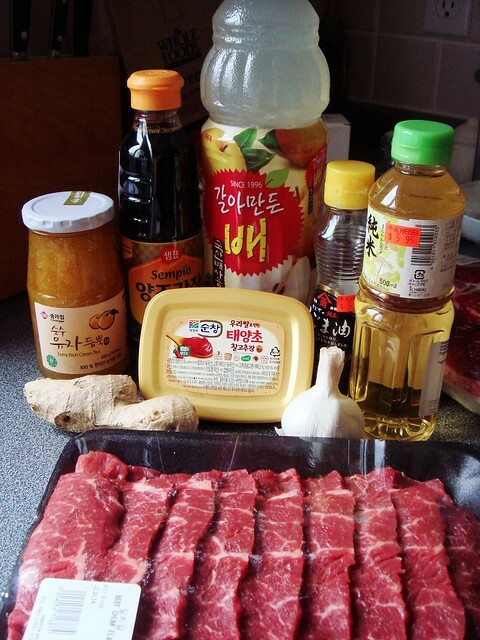 The pan-seared bulgogi tasted phenomenal so where did all the flavour go? I suspect I was too thorough with blotting the raw meat dry of excess marinade. 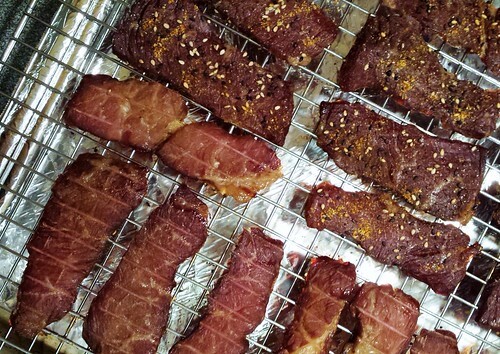 For my next batch, I plan to trade in longer baking time so the excess marinade can cling and caramelize on the meat. 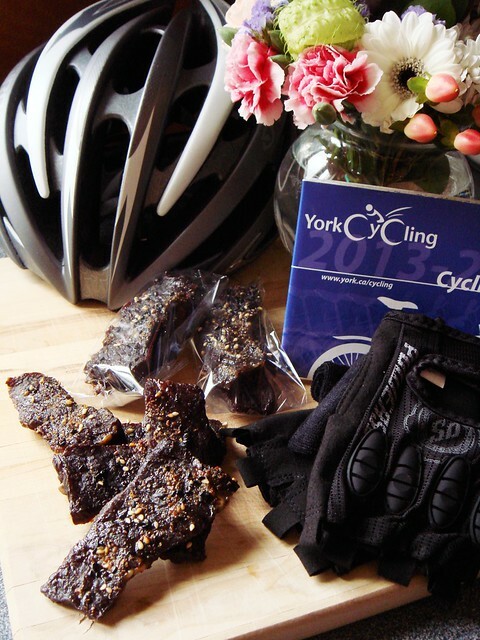 I challenged one of my friends to a homemade beef jerky taste-off. He has much experience with this and developed his own recipe. In the next couple of weeks, we will set up a blind tasting panel and let tasters evaluate based on seasoning, texture, and overall preference. Win or lose it will still be a fun challenge for everyone. 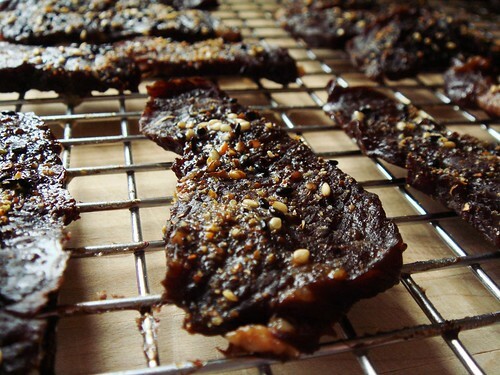 I will let you know if my bulgogi beef jerky is up to snuff!